I’ll start by saying pink is my favorite color. 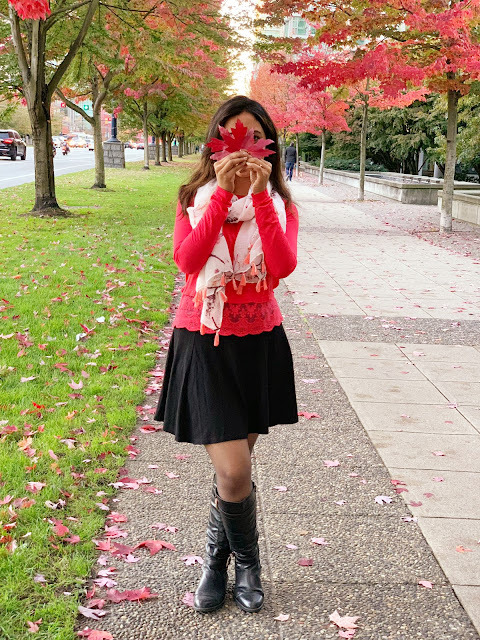 Who would have thought a combination of 2 distinctive colors (red and white) would make such a beautiful color?The color pink represents everything sweet and beautiful. It’s the color most associated with cute, nice, romantic, feminine, babies etc. Similarly pink color foods are the most beautiful and delicious foods, like Strawberries, raspberries, rhubarb, cakes, cupcakes, ice-creams, marshmallows etc. Picking a pink food for Navratri day 9 wasn’t difficult at all. Smoothie bowls are thick, creamy, satisfying and here to stay! 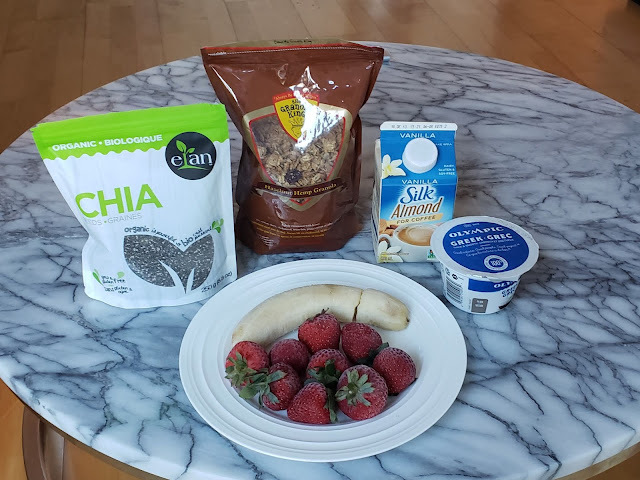 I made a yummy Strawberry Smoothie Bowl a perfectly healthy and vegan snack/breakfast. 1. 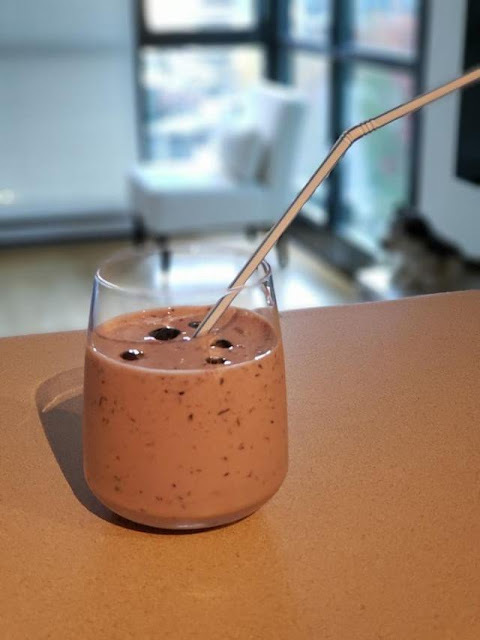 Combine frozen strawberries,frozen banana, almond milk and Greek yoghurt in a blender. Blend until completely smooth and thick. 2. Add more milk if necessary to make it smooth. 3. Transfer the mixture to a bowl, add toppings as you like and enjoy the perfect bowl. And here's my Pink Outfit. Hope you guys had a lovely Navratri. And Happy Dussehra to everyone! As the name suggests Sky Blue color comes from the color of the mighty sky. Just like the name it is associated with stability and heaven. Blue is also considered beneficial to the mind and body as it is believed to bring a calming effect. When it comes to natural blue foods they are the rarest of kind. The most commonly found natural blue foodsare blueberries, red cabbage, blue cheese and jamun. Since none of these have a natural sky blue color I came up with a preparation which has a bit of blue in it. 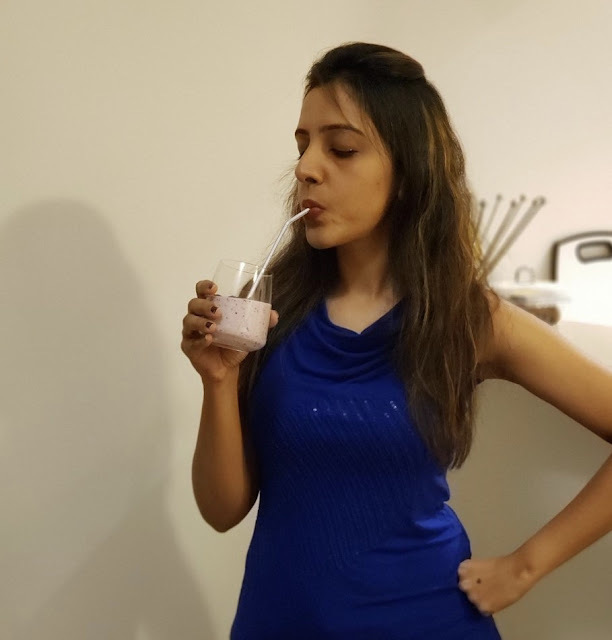 Day 1 of Navratri was associated with Royal Blue color on which I made blueberry oats smoothie. I already used the most commonly found blue food and didn’t want to use it again. However, there’s another blue colored berry that has over the last few years gained the title of being a superfood - the Acai berries. 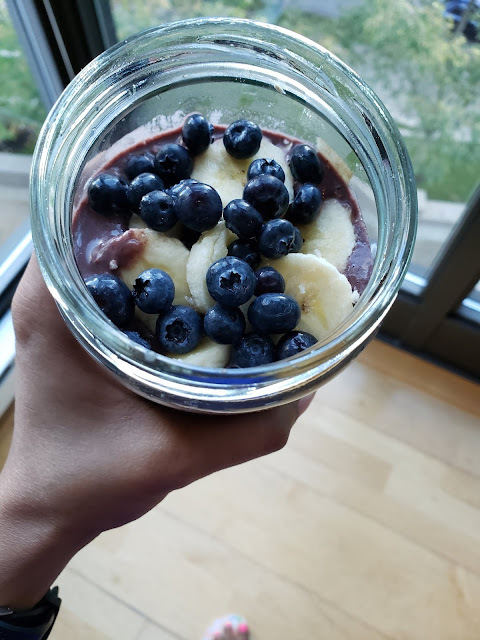 Packed with antioxidants, amino acids, fiber, essential fatty acids, vitamins and minerals makes acai berries a near perfect energizing fruit.No wonder acai smoothies and acai bowls are considered a wholesome and yummy breakfast. 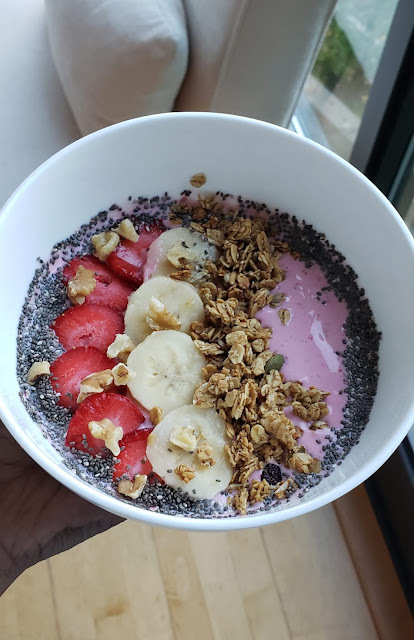 Since acai berries are grown primarily in Central and South America and are highly perishable, fresh berries are not readily available in North America. But these are available in frozen pulped packets at only specific stores in Canada and are perfect for creating your own smoothies at home. 1. 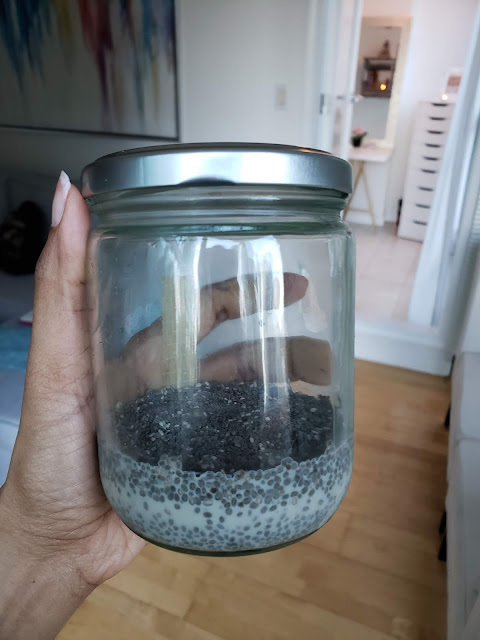 Soak chia seeds overnight in almond milk. 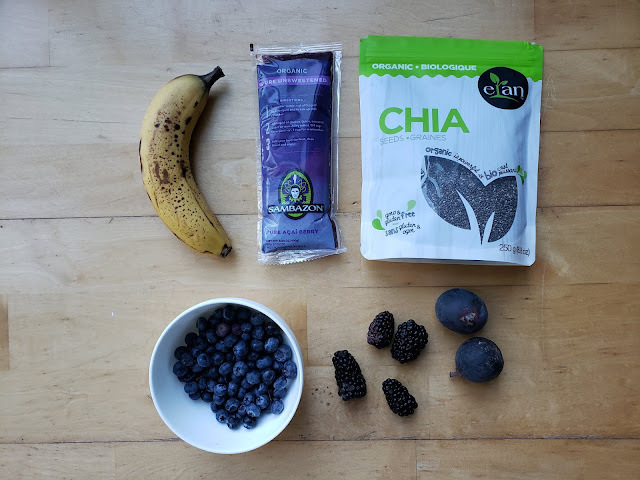 (This step is optional) Chia seeds can be consumed raw and added to the smoothie as topping. 2. To prepare the acai purée, in a blender, add banana, acai pulp, blueberries, blackberries and a splash of milk. 3. Blend until all ingredients have come together. 4. Add the blended puree to the overnight soaked chia seeds and top with your choice of fruits and nuts. 5. Enjoy as a bowl. If you prefer as a smoothie glass, add more than just a splash of milk to get the smoothie consistency. And now my sky blue outfit. Red is the color of blood. It is also associated with love, passion, heat, fire and danger. It’s an intense color and is linked with intense feelings and gestures, both positive and negative. 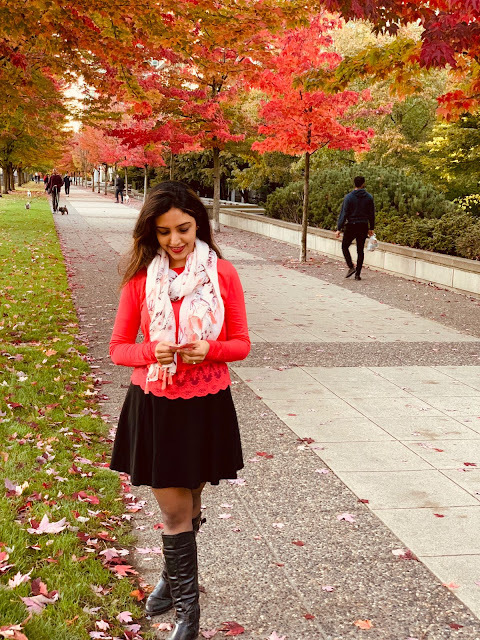 In India the color red has a special sentiment for married women and in the west the combination of green and red traditionally represents Christmas the most joyous holiday season. Red foods are health heroes when it comes to a balanced diet. Packed with lycopene that protects our skin as well as reduces risks of cancer. Cherries, raspberries, watermelon, tomatoes and beets are the most easily available reds that can be included in our daily diet. 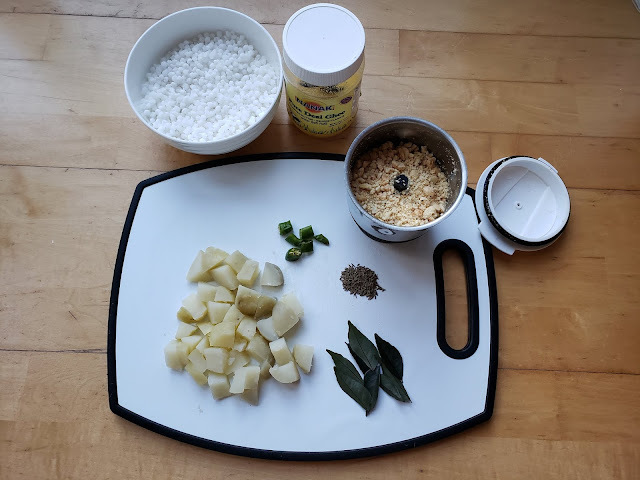 This is a very versatile recipe and can be modified as per your likes. I’m going to pen down how I made it this time. 1. In 2 tbsp. olive oil sauté onions for a few minutes or until golden brown. 2. Add ginger garlic paste and cook for another minute. 3. Add chopped tomatoes, salt, chili powder, turmeric powder and cook for 5 – 6 minutes. 4. Add grated or finely chopped paneer and cook for the mixture for 2 more minutes and remove from heat. 5. Slice off the tops of each bell pepper, remove seeds and clean out the pepper thoroughly. Lightly grease the pepper with olive oil on the insides. 6. 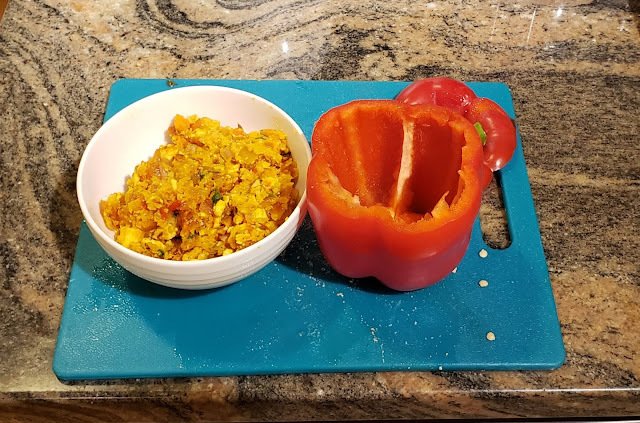 Carefully spoon mixture into hollowed-out peppers and top with grated paneer. 7. Place it in the oven and bake for 25-30 minutes on low temperature, or until the peppers are tender. Alternatively you can cook in a non-stick sauce-pan with the lid covered. And my red outfit for today is here.. The color whiteis the most positive colorof all. It is associated with purity, light, heaven, cleanliness, spirituality and perfection. As humans, we tend to typically portray the good guy in white and the bad guy in black. That’s the significance of the color white. When it comes to food, we believe in eating the colors of rainbow. White foods are generally considered unhealthy because most refined and processed foods are white in color, like sugar, bread, rice, white flour etc. But the fact is there are many white foods that are good for our health.White foods contain nutrients that we need in our diets like anthoxanthins which help lower cholesterol and blood pressure and sulfur which detoxifies our liver and help with protein structure and skin health. 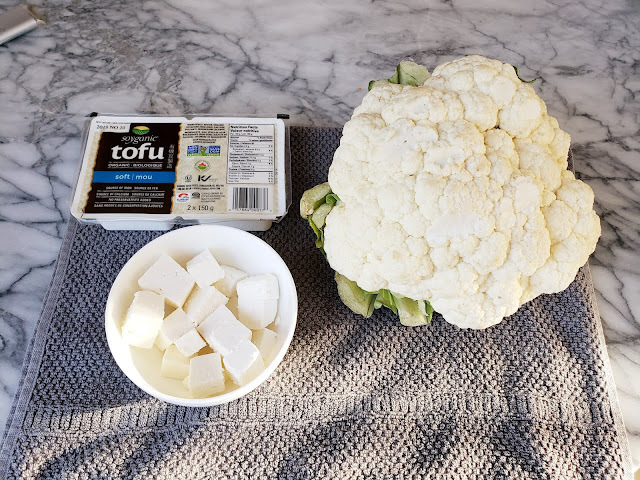 White foods like cauliflower, cabbage, beans, onions, garlic, mushrooms, tofu are very healthy and can be easily included in our daily diet. 1. 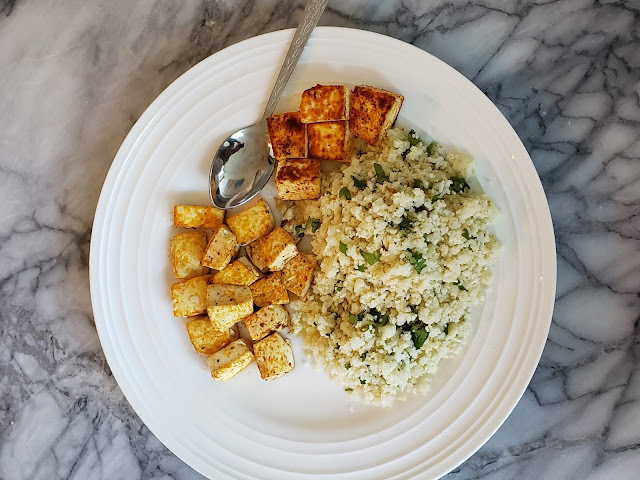 To make the cauliflower into rice: Chop the cauliflower into florets, then place the cauliflower (in 3 or 4 batches) in a food processor and pulse until the cauliflower is small and has the texture of rice. Do not over process it, you don’t want it to be mushy. 2. Preheat oven to 400F. Spray the baking sheet with oil. 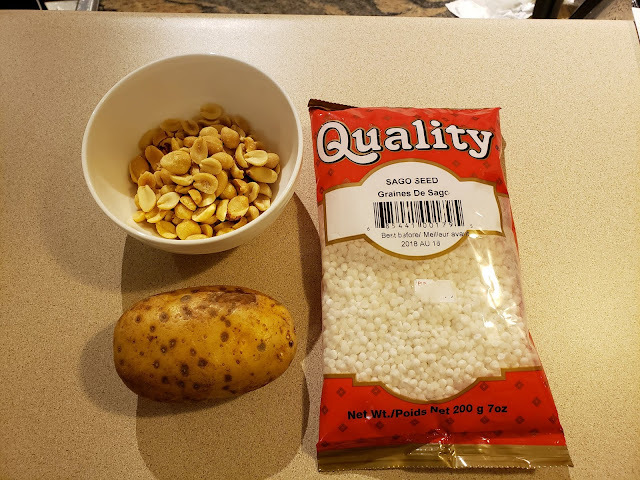 Combine the riced cauliflower, olive oil, garlic and salt on the prepared sheet, spread out in a thin single layer and roast in the oven for 15 -20 minutes. 3. Remove from oven, top with fresh lemon juice and parsley and mix it well. 4. Pat the tofu/paneer dry with paper towels to remove excess water. Cut into 1/2-inch slices. 5. Heat a large pan over high heat. Add oil and after the oil is hot, carefully add the tofu/paneer into a single layer. 6. Sprinkle salt, pepper and chili powder. 7. Sear each side for 1-2 minutes, or until sides are golden and crisp. And this is my White outfit. Hope you like it. Orange is the color associated with warmth, fire and energy. In Asia it is an important symbolic color of Buddhism and Hinduism. For me it’s the color of the current season, fall! Every color is rich in specific nutrients that help make a well-balanced diet. The nutrient that is available in orange food is the antioxidant beta-carotene, which also helps support healthy skin, hair and vision. It’s important to make sure to have some orange on your plate each day. The yellow color in citrus fruits doesn’t contain a lot of beta-carotene, but is instead loaded with another antioxidant, vitamin C which also helps fight infection. 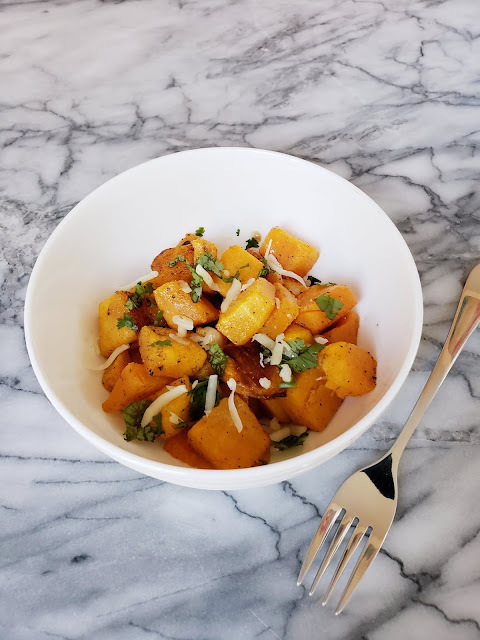 While there are variety of orange foods available in the market I decided to go with the ultra-nutritious and versatile (to cook) Butternut Squash. It’s rich in potassium, fiber and vitamin A. It also protects your skin, keeps the bones strong and aids in weight loss. To save time I bought a pack of peeled and diced butternut squash. Since there was a lot and I wanted to make 2 dishes. 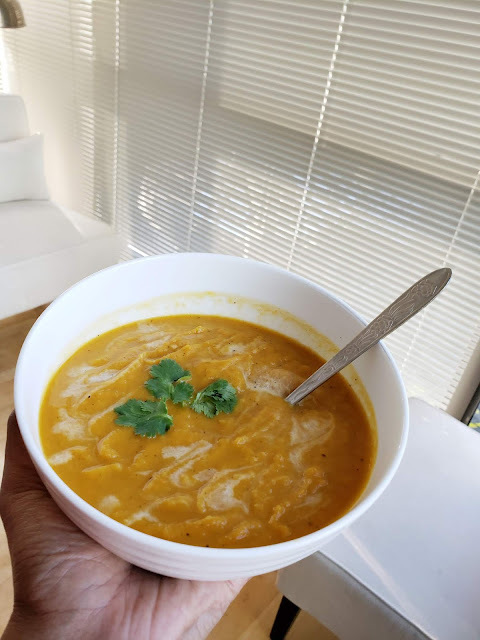 So I made a Simple Roasted side dish and a curried soup. 2. 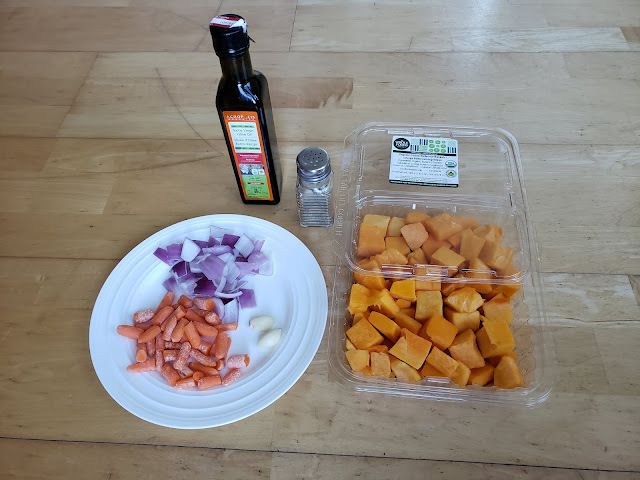 Toss butternut squash, onions and carrots with olive oil and garlic in a large bowl. Season with salt and black pepper. 3. 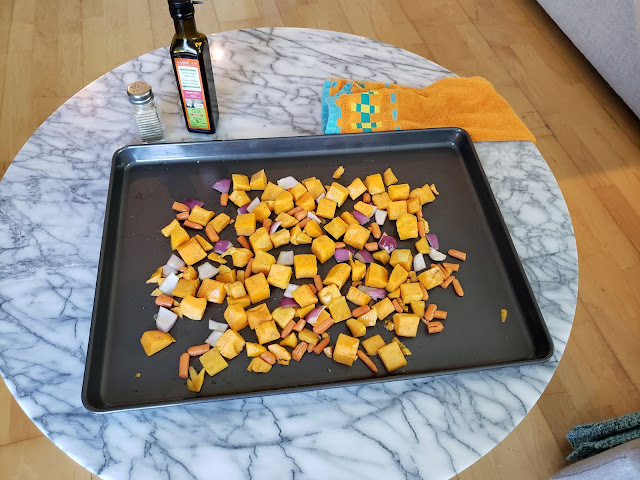 Arrange coated squash on a baking sheet. And here's my Orange outfit. Green is the color of nature which also symbolizes peace, freshness, safety and environment. Green foods are powerful antioxidants that protects human body from toxins. They are also rich in chlorophyll, a green pigment that also acts as a detox agent in the body. Green fruits and vegetables are loaded with minerals like Vitamin A, Vitamin C, Potassium, folate, fiber etc. Basically including greens in your daily diet can go a long way for your health. I love all kinds of green vegetables and fruits but I find it challenging to add it to my daily diet. I’m trying to change this by adding small portions of spinach and kale in my smoothies, adding broccoli and avocado in salads, I also sometimes snack on baby cucumbers and celery. These are baby steps towards attaining a healthy and well-balanced diet. 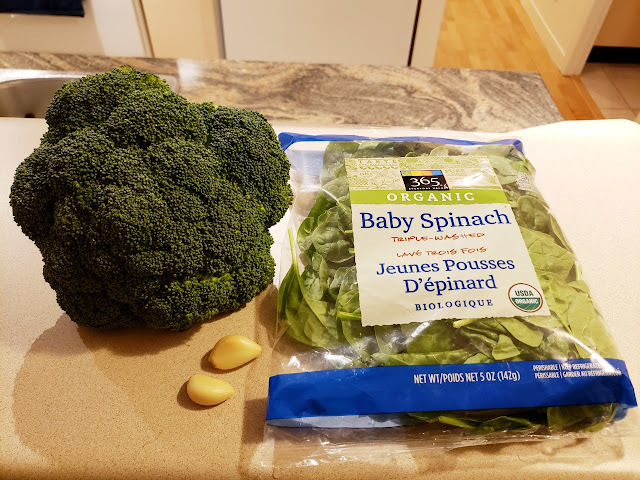 So when it came to picking a dish for green day, I went with my 2 favorite greens – Spinach and Broccoli. Add vegetable broth and bring to a boil. Add the spinach, remove from heat and let the soup cool. Add mixture to the blender and pulse until thick and smooth. Soup is ready at this point, pour into bowls and serve immediately. Variation: You can add cream or Greek yoghurt to give the soup a creamy texture and taste. 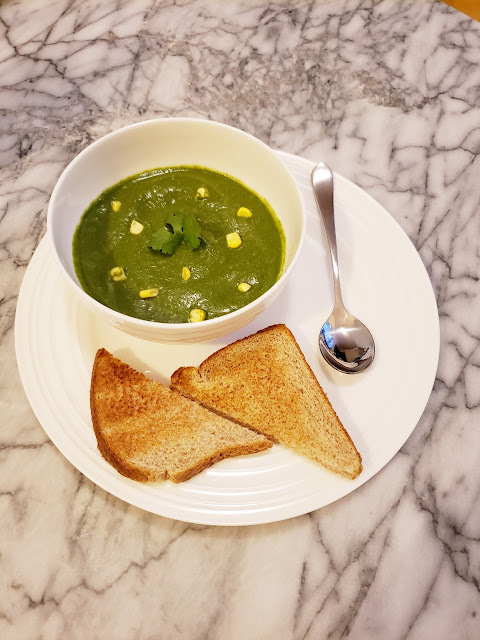 I added some leftover sweet corn to add a bite to the soup. And here's my green outfit. Hope you like it. 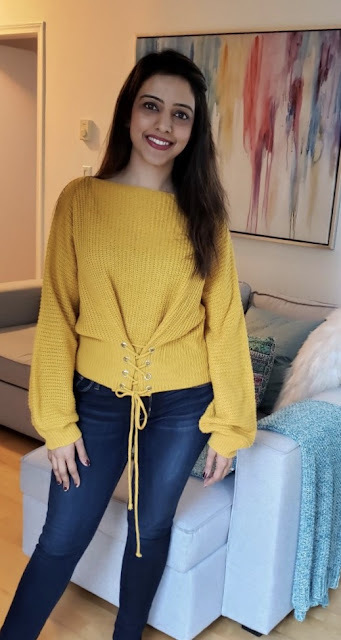 Yellow is one of my favorite colors but it’s only now that I found out, yellow foods contain nutrients like beta-carotene, potassium, vitamin C among many others. These nutrients do a number of things, some of which are reducing age-related degeneration, the risk of prostate cancer, lowering cholesterol and blood pressure, assisting in detoxification and encouraging a healthy alkaline balance. 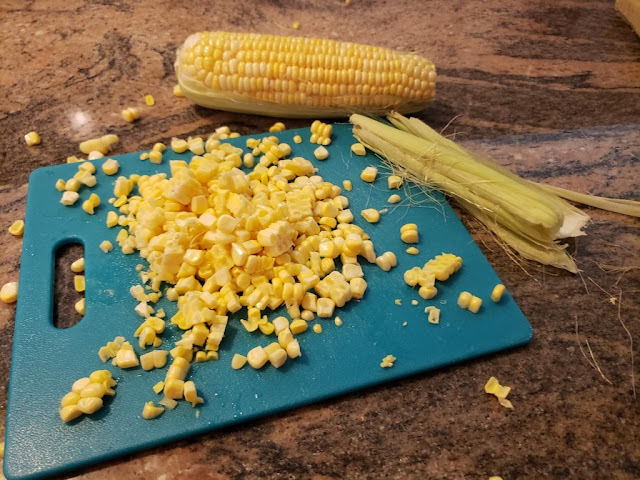 I read somewhere one of the 5 yellow foods one needs to eat to save our gut is Sweet Corn. 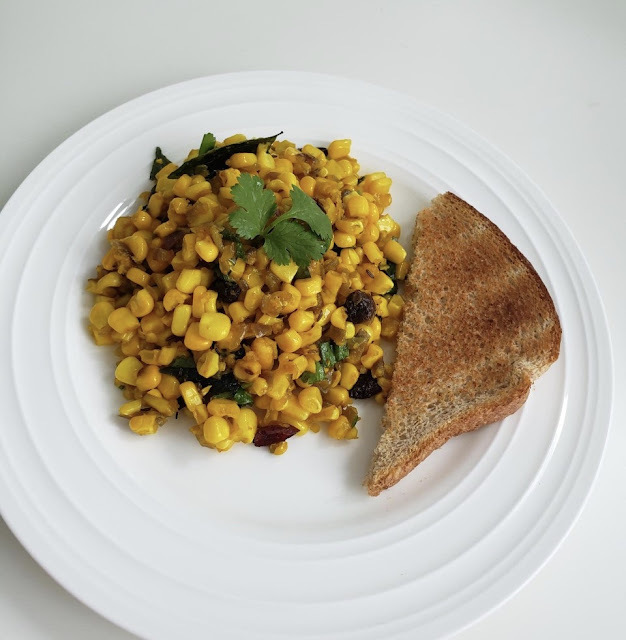 Therefore, on the second day of Navratri which is associated with the color yellow I decided to make a preparation using sweet corn taught by mom. There’s no assigned name to this dish so I just call it Mom’s style Sweet Corn. Yellow corn has more nutrient value than white. It’s an excellent source of dietary fiber, loaded with vitamins B1 and B5, vitamin C, manganese among many others. ½ a cup of corn has about 75 calories and two grams of protein and almost four grams of fiber. Although the list of ingredients is a bit long, the preparation time is less than 20 mins with all ingredients ready. 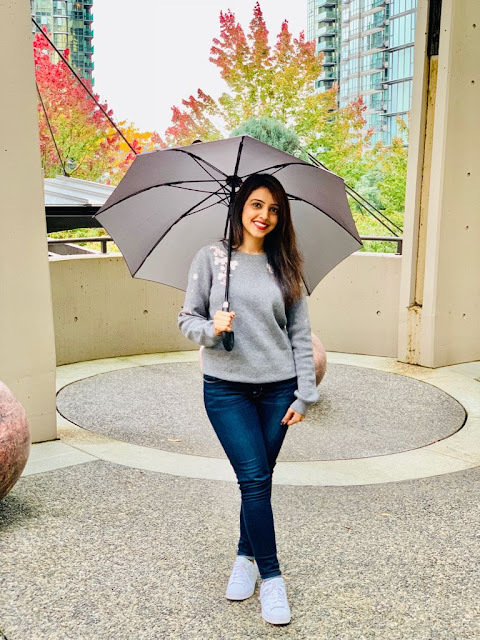 Hope you guys are having fun this Navratri! It’s that time of the year again when colors bring a whole new meaning to our mundane lives, they’re associated with good luck and considered sacred during these nine days. Yes, it’s Navratri, one of the biggest festivals celebrated in India with great devotion and passion. According to mythology, 9 days of Navratri are devoted to different forms of Goddess Durga and is denoted by nine colors. 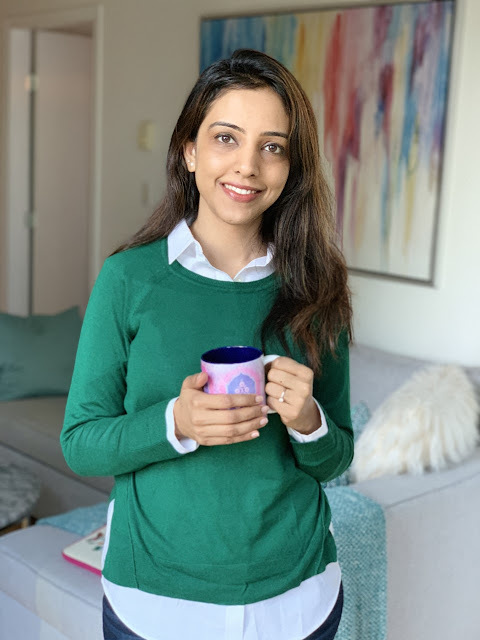 Where I grew up, people followed the pattern of wearing specific colors during the 9 days of Navratri. I also believed in the idea that if I wore the color associated to the day it will bring good luck. But in the hindsight, I didn’t care if it really brought me luck, I think it was my way of worshiping the goddess and celebrating the festival. It just brought me happiness. 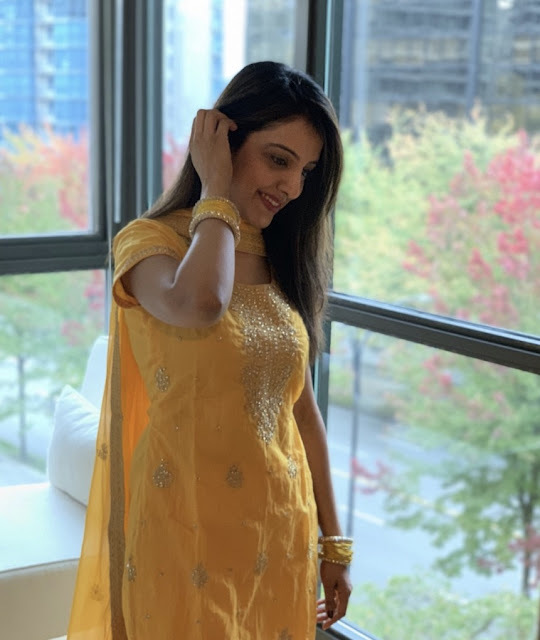 Last year was my first Navratri celebration in Canada and I followed the tradition of wearing the 9 colors of Navratri at work. 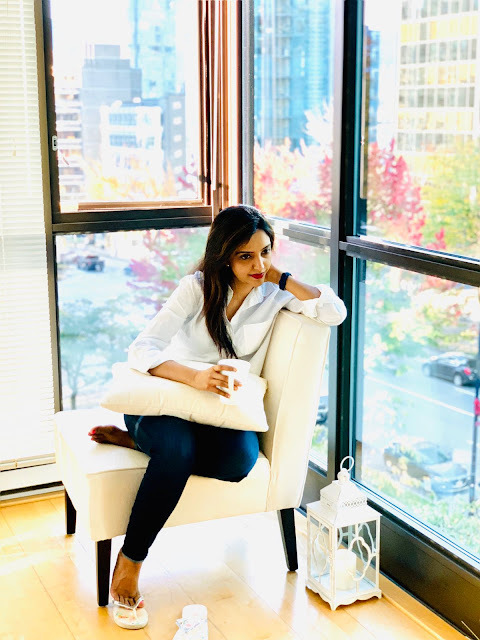 Checkout the post here. This year too, I’m going to try and keep the tradition alive but I’m going to do something more. I’m going to add the color dynamic to my food :). 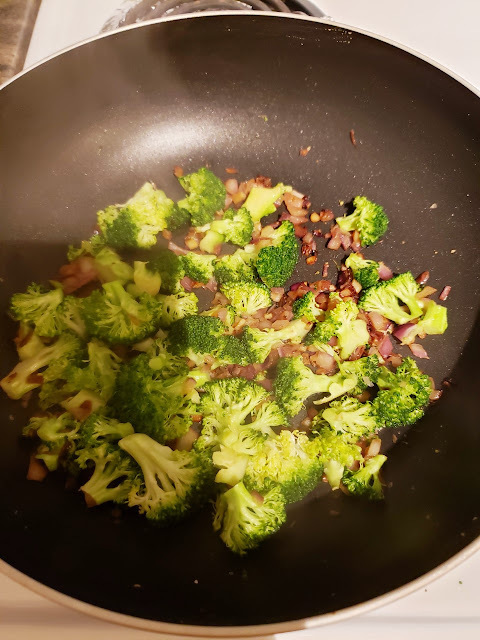 I cook at least one of my daily meals at home, I’m going to try to use natural ingredients of the color associated to the day to make at least one meal a day either breakfast, snack or dinner; simple and healthy. 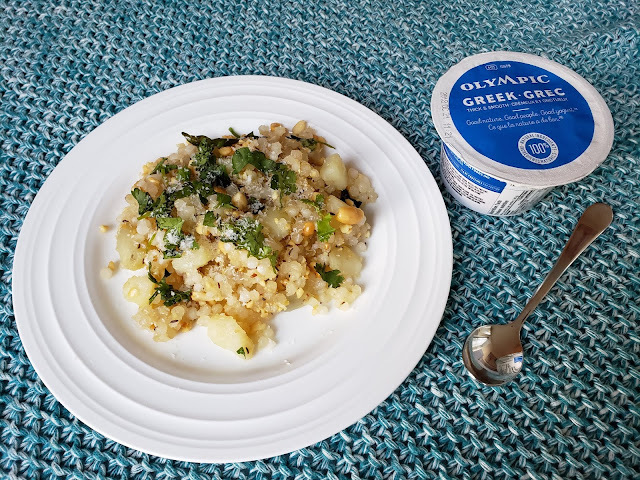 I’m going to share the pictures of the food I make and the recipes on the blog every day. Royal blue is associated with superiority; to me it symbolizes reliability and trustworthiness like any other blue color.Blue colored foods are also very nutritious and loaded with antioxidants which are great for the immunity of our body. 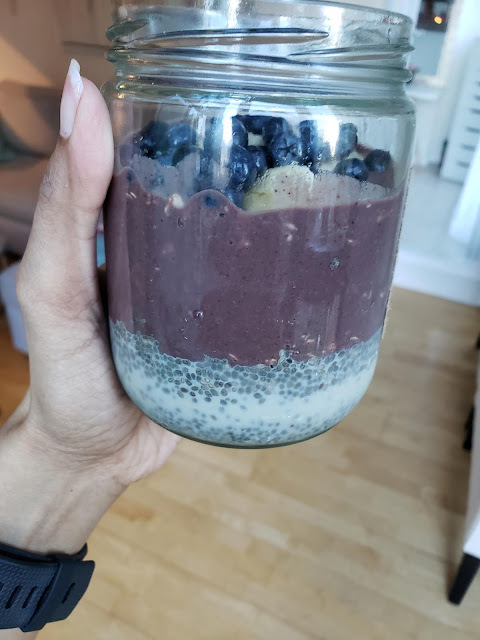 Unfortunately, they’re difficult to find in our daily diet and just because of lack of availability of many options around me, the first thing that comes to my mind when I think about blue food are blueberries. 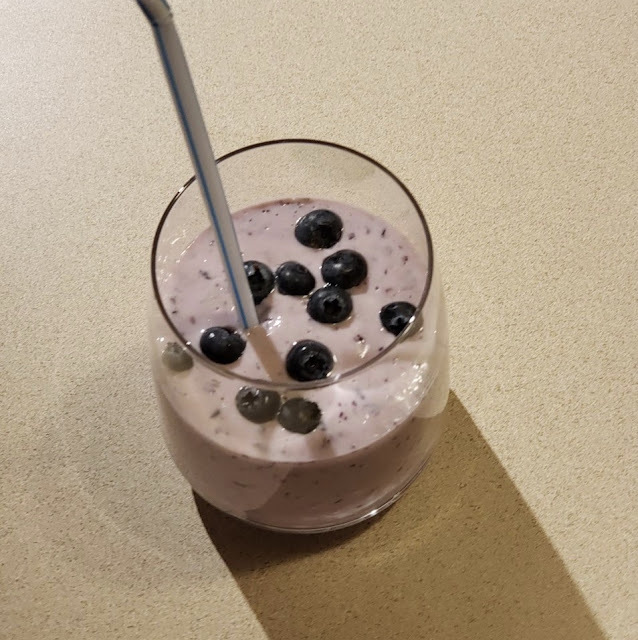 So, I decided to make a healthy Blueberry Oatmeal Smoothie. 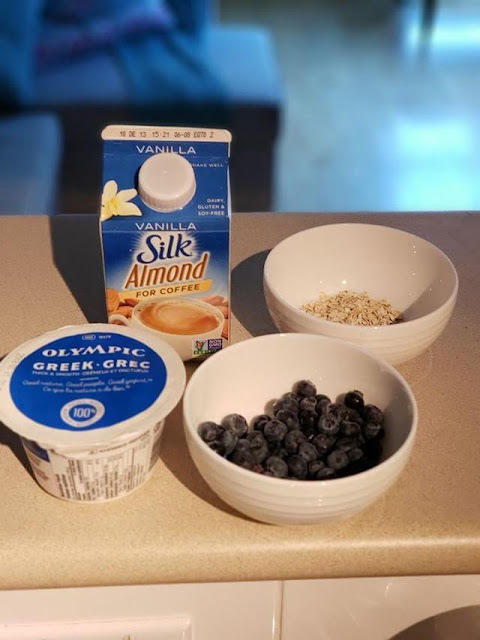 With just 4 ingredients this healthy and satisfying drink is quick to make and is loaded with goodness of protein and fiber. Just blend everything together in a blender and the drink is ready. The above ingredients are what I used for my drink but you could replace it with different flavors or keep it original. Additional ingredients like frozen/fresh bananas and peanut butter could be added to make it more interesting. 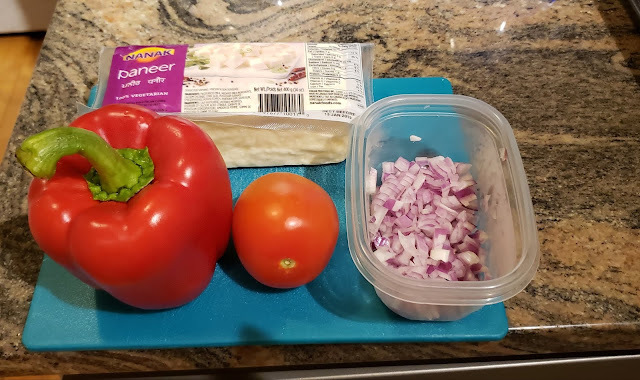 I find the above 4 ingredients work well for me so I like to keep it simple. And for the first day enthusiasm, also in a royal blue traditional attire. Hope you guys, enjoyed reading the post. 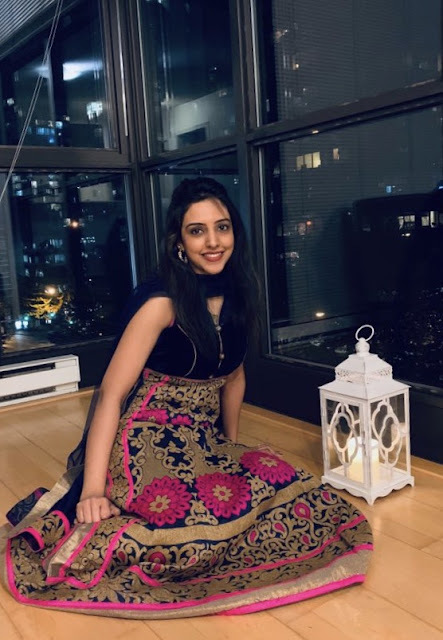 How are you celebrating Navratri? Let me know in the comments below. Hey everyone. Thank you for all the love and comments on my last post. It really means a lot. 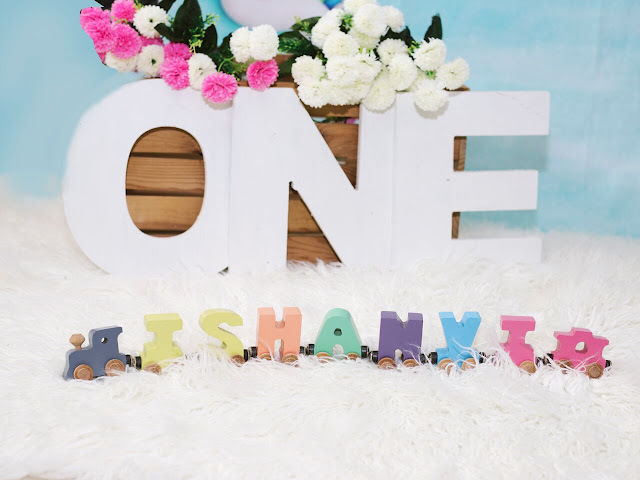 I am writing today's post because I don't want to forget how we picked our daughter's name. 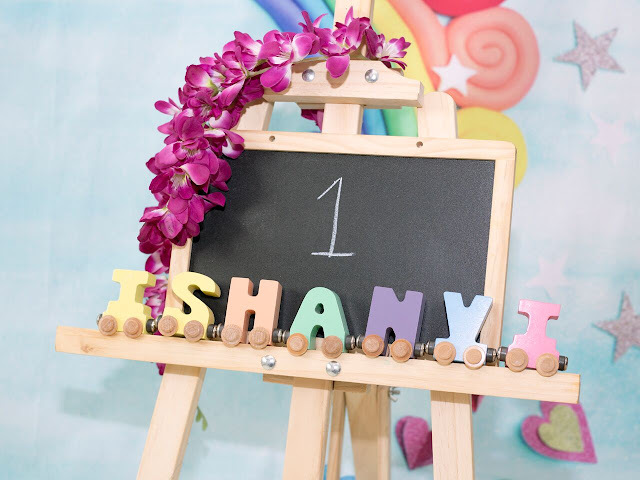 After a lot of arguments, we picked the name Ishanvi for our daughter. But how did we finalize it?...Scroll down if you really want to know. really fascinated me. I have suggested names for my cousin's babies and even pets. For the longest time, I wanted to have a pet dog, because I want to name him Ranveer. In fact I have even named my soft toys. One was Samrat, the other one Vikramaditya and the third one was called Aasma. SO,the bottom line is, I wanted a baby of my own so that I could name him/her. a) the father of the child had similar dreams like me..n wanted to name her too. b) my postpartum blues were at its peak, which made me feel that my husband was totally unfair and mean for wanting to name our baby. The story goes like this, even before we knew if I was having a girl or boy, I had decided that if I have a girl, I would name her Ira. Fast forward to our baby's delivery day. The moment my husband picks our baby in his arms, he announces, he wants to name her Khushi; because holding her in his arms had filled him up with so much joy and happiness. I clearly told him..that's not happening. And he said...we will talk about it later. After a few days when I came home, the feeling actually started sinking in. We had to finalize a name for our baby sooner or later. Since I was staying at my parent's home after my delivery, every day when my husband came over to meet us, we had arguments. I hated Khushi and he hated Ira. He didn't like the names that I liked and vice versa. Traditionally as per our family culture, we name the baby on the 12th day of her birth. So after discussing for almost 10 days, going back and forth, husband and I decided that we will name our baby Raahii....meaning traveler/explorer. I really liked the name and started dreaming of our baby traveling and exploring the world. So, this was two days, before the official naming ceremony, and exactly on the same day, an American colleague from work emails my husband asking him, if we had picked a name for our baby, and my husband replied that we were still thinking over it. "OK..make sure the name embodies Beauty, Courage and Strength!" After reading it, my husband called me instantly and said we have to rethink the name that we decided for our baby. When he forwarded me the email, my reaction was...OMG! That is so profound and thoughtful. 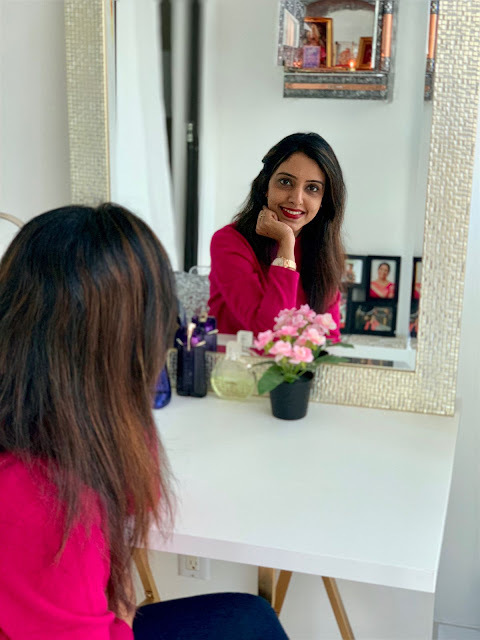 I have always believed that the name of a person, plays a huge role in shaping their personality. And I really want my daughter to be strong, brave, independent and dependable. And so, we put on our thinking caps again. One Indian Goddess that really embodies all these qualities is Goddess Parvati/Durga. So we started looking for names of Goddess Parvati/Durga and stumbled upon Ishanvi. We took less than 10 minutes to finalize it. And the rest is history. I hope Ishanvi, our daughter loves her name more, after she hears this story. This is our baby's naming story. Tell me about yours.